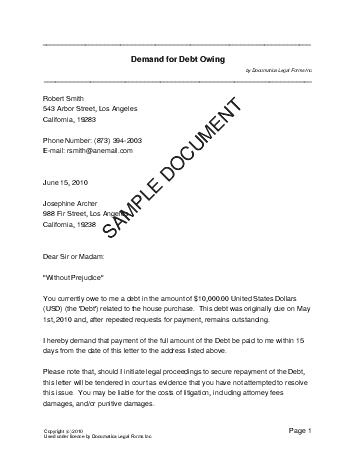 A Demand for Debt Owing is a letter demanding payment of a debt (either the original amount, a reduced amount, or installments) within a certain time period. If legal action is later initiated to recover the money, this demand letter can serve as evidence in court that the debtor has not attempted to resolve the matter. How many creditors are there? Is this creditor a corporation? How many debtors are there? What is the nature of payment you are demanding? How many days are you allowing for payment (e.g. 30)? How much time are you allowing for payment (e.g. 2 weeks, 3 months, etc)? What day of the week will payment be due (e.g. Friday)? What day of the month will payment be due (e.g. the First)? What day of the year will payment be due (e.g. January 1st)? Do you wish to attach any relevant documentation to this agreement? We strongly recommend obtaining an attorney reviewed Demand for Debt Owing directly from us. Below are some random samples we have created with Documatica. Please note that these documents reflect a certain set of answers, and it is very likely that the document you require is different. Do not rely on the templates below - create your own customized Demand for Debt Owing with our webpage. For maximum legal protection, obtain a lawyer reviewed Demand for Debt Owing directly from us.